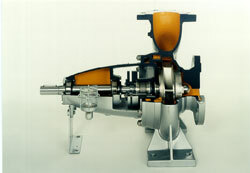 NKL Pumps are used as circulation pumps for thermal oil. Operating temperatures up to 650° F are possible without cooling. Single acting mechanical seals design NOq with rotating bellows and wear resistan seal faces of Silicon Carbine (SiC) ensure long service life. NKLs pumps are single stage volute casing Pumps with closed impellers, back pull out design, with end suction and top discharge flange. Dickow Pump Co., 1738 Sands Place, Marietta, GA 30067. Tel: 770-9527903; Fax: 770-933-8846.